One of my sons was visiting a few weeks ago. He asked to look through the family photo albums from when he was young. I gulped and explained that I took all the photos out of the 20 or more albums that were kicking around gathering dust and damaging the photographs with that horrible stick-down clear plastic film. Out of storage came several tubs (neatly labelled) of photos and he started going through them. I felt discouraged watching him! They were not in any particular order, most were not identified and I realized what a jumbled mess I had on my hands. As a genealogist it's important for me that I document our family history and preserve photos and other family treasures. I've scanned most of my older photos (pre 1950) but have been sadly negligent with the recent ones! But as I watched him, his face alight with memories and the happiness of looking at all these wonderful family pictures, I realized I have to stop procrastinating and do the job. But it's overwhelming. How does one start? I don't think I can face scanning the hundreds if not thousands of photos I have. Then I realized that when a task seems overwhelming it's best to break it down into smaller chunks - smaller jobs. So I have a plan. Right now that's all it is - a plan, and a tentative one at that! 3. Pull out duplicates and set aside for now. 4. Pull out the photos I can't live without and set them aside. Do I take the photos I can give up and put them in albums for my children? That would be easiest but then there are no copies. Do I take the best photos and scan them, then print them off and put the copies into albums for my children and grandchildren? I could store the originals in labelled envelopes or storage boxes or albums. I'm leaning towards choosing the best photos and scanning them, then either printing them or putting them on CDs for my children and grandchildren. If anyone has suggestions, I would love to hear them! Maybe you have a great solution for this mountain of work facing me! The Peer Family in America - available now! Vol. 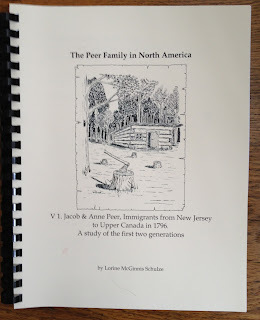 1 The Peer Family in North America: Jacob & Anne Peer,Immigrants from Sussex Co. New Jersey to Upper Canada in 1796, a study of the first two generations including documents and maps by Lorine McGinnis Schulze is READY FOR PURCHASE! I hope you are as thrilled and excited as I am! Please check the online form for the cost and shipping information for Vol. 1. You will be able to use cheque, money order (international only) or Paypal to place your order. To see a list of my other books which are available, please visit my Publications page. Yesterday around 1:45 pm we were rocked by a rather strong earthquake. That's pretty rare here in central Ontario. Our walls shook. Windows rattled and our porch roof undulated. Objects fell. Turns out a 5.5 earthquake hit outside of Ottawa and was felt for quite a way. Midland declared a state of emergency and we were all told to take shelter and stay inside. Power to almost 14,000 residents was lost and is still off. 200 people are homeless. 20 are in hospital. We were lucky. We still have power and no one was hurt. Around 8 pm there was a severe weather warning for our area for hailstones and strong wind but that never materialized thank goodness. But now for something completely different...thick fog started rolling in about 11 this morning. And the town is still cordoned off with highways closed. There were fears of a gas leak but that appears to be okay now. This morning hubby and I tried to get to the other side of town to the Medical Centre so I could pick up my meds but no dice. It's okay as I have just enough until Monday. New Netherland Settlers: The Stevensen and Jacobsen Families. I'm very excited to announce the completion of another book in my NEW NETHERLAND SETTLERS series. It's taken 9 years (gulp!) to complete the last little bit, but it's done. New Netherland Settlers: The Stevensen and Jacobsen Families. A genealogy to three generations of the descendants of Maria Goosens and her husband Steven Janse Coning who settled in Fort Orange in 1649 (Stevensen Family) and Maria Goosens and a man named Jacob (Jacobszen Family) is now available. Descendants may order a copy by downloading this Order Form or you may use the Paypal button on that page. A brief excerpt was previously published as The European Origins of Steven Janse Coning in the December 2001, Vol. 6 No. 4 issue of New Netherland Connections. My book completes several years of research into the origins and descendants of Steven Janse Coning who was baptized in 1617 in Nijkerk and settled in New Netherland with his wife Maria Goosens circa 1649. By 1663 Steven and Maria had at least 7, possibly 8 children. 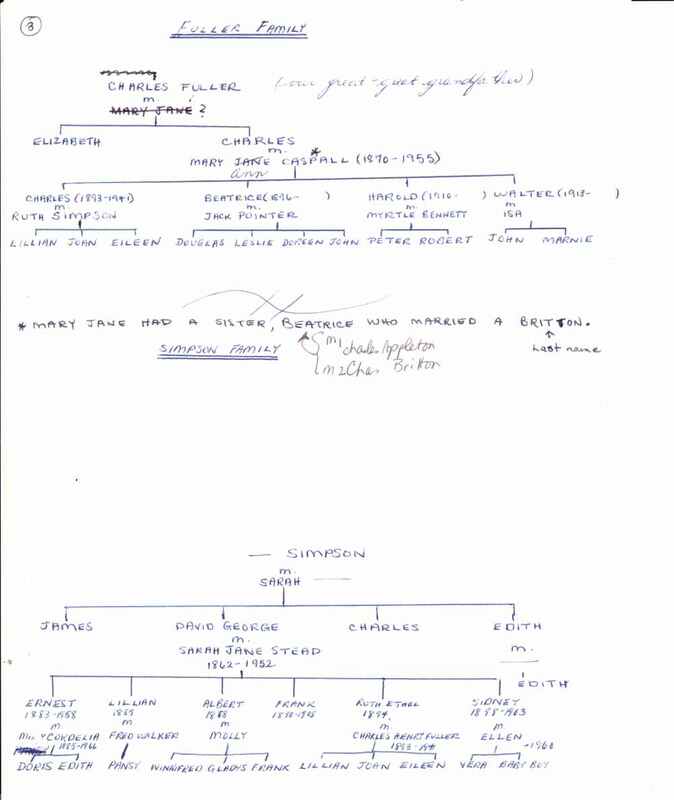 After their divorce in 1663 Steven and Maria married other spouses, and Maria had one more known child born to a man named Jacob whose surname is unknown. This book follows Steven, Maria and their descendants to three generations. family's suffering when the Bubonic plague struck Nijkerk in 1636 when Steven was only 18 years old is well documented and included in the book. Please visit Published Books for other books in the New Netherland Settlers series as well as miscellaneous genealogy-history books. Do you remember the first time you started your genealogy hunt? I do. My father always talked about wishing he knew where in Ireland our McGinnis ancestors came from. My grandmother (on my mom's side) spoke endlessly of her family back in England. Here is one of the first charts I made at age 14. Lots of blank spaces and question marks for names! I'm a packrat and I kept all my original notes. I knew nothing about genealogy, in fact I didn't even know that word! No one in my family was interested and no one knew about family trees or ancestry or... anything genealogical. So I invented my own system for keeping track and recording facts. 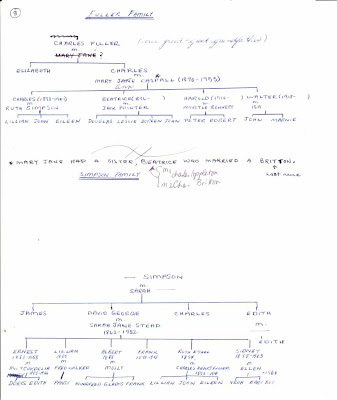 It looked much like the Family Group Sheets we see in genealogy programs today. Then I began creating charts which helped me figure out what I had and what I was missing. Of course I had no idea how I would ever find the missing bits but I guess I was an investigator-researcher even at a young age. I figured there must be a way. My next step at age 15 was to go to our local library (where I worked!) and find a book on finding out about one's ancestors. Luckily I discovered Angus Baxter's books on searching for ancestors in Canada and in England, which were the two countries I needed. Then I put my genealogy notes and interests aside for the next 10 or more years. My next surge into genealogy was in my mid 20s. I was newly married, living in a new town, didn't know anyone and so I pulled out all my notes and charts to review them. I phoned my aunt to ask questions and created new charts and note pages. Here's one from those years. 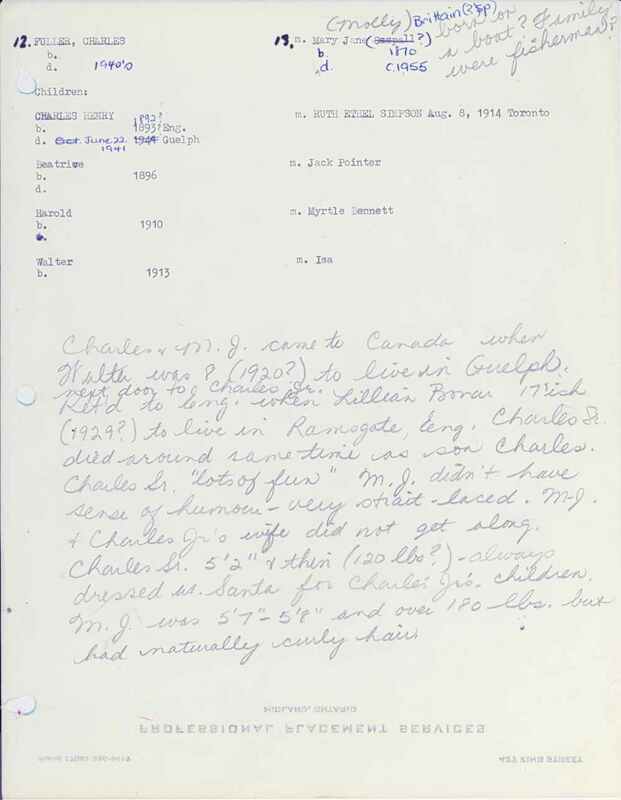 Then I started searching census records on microfilm. That was my first step into the big wonderful world of libraries, archives, museums, microfilm and all the records I could find. But how times have changed! Now there are thousands of times more records available. And they're available online. I'm so glad I started my genealogy research at a young age and have been able to take advantage of the amazing record collections available today. But sometimes I long for those first early days when everything was new and I could sit with my aunt or my grandmother (who are long dead now) and ask a zillion questions. Do you remember your first time? Group Photos include photos of Sports Teams (Lacrosse, Hockey, Baseball, Soccer, Football, Curling, etc), School Pictures (Teachers and Students), Military Photos and other assorted Groups. Feel free to copy and save any photos for your own personal use. They may not be reproduced or published elsewhere such as online websites or in books without my written permission. Submissions of group photos are welcome. Please send photos to Lorine at olivetreegenealogyATgmail.com Change the AT to @ before sending your email. Great Grandma, When Did you have your Portrait Taken? Do you have old photographs that you can't put a year to? 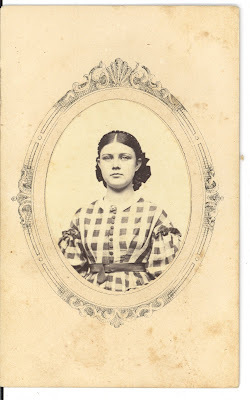 Are you wondering when that gorgeous photo of great-grandma Olive was taken? Once you've looked through the examples and read how to date an old photo, you may want to have a peek at the Civil War Era family photo albums I collect and place online on Lost Faces. Have you read Shades: The Departed? Shades is an online free magazine that is well worth reading. I've directed you to the April issue on the Civil War. If you turn to page 46 you will find an article called "Civil War Costume" which I wrote for the magazine. It's illlustrated with over 30 Civil War era photographs. Don't miss the other articles in the April issue, they are all excellent. The May issue can be found online as can all other back issues. 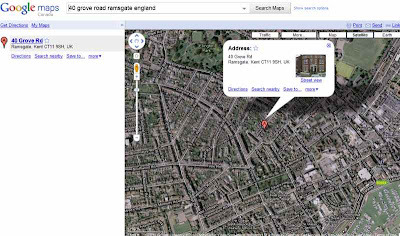 Google Maps is my new best friend in Genealogy! 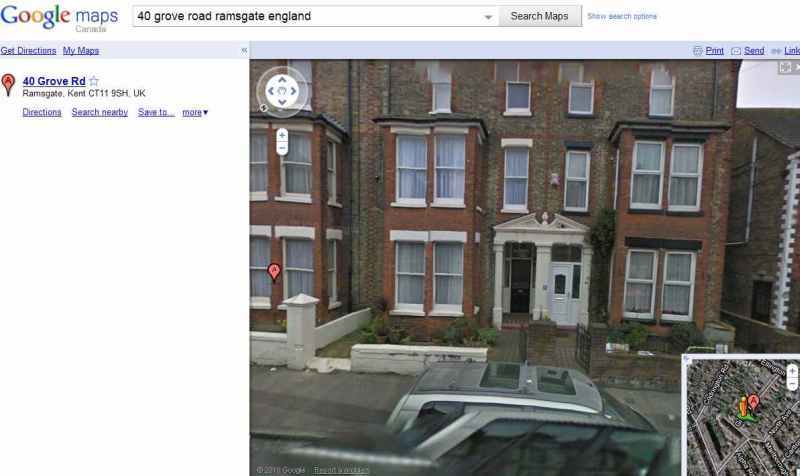 My grandparents were born in England in a town called Ramsgate in Kent. I've never been to England but I've always wondered what the houses they lived in look like. What are the streets like where they played and walked to school? Recently I discovered Google Maps Street View and I'm thrilled. Using Street View I was able to see the home where my great grandfather died in 1920. He'd lived there for almost 20 years before his death and seeing it was a very moving experience for me. I could picture my great-grandma coming out the front door and walking to the nearby shops to get groceries. So many images came to my mind! I could zoom in or out, I could change that to satellite view or whatever I want. It's the view taken from the street looking at their home. Now, Google Maps isn't 100% accurate so you do need to do a little moving around to be sure you are looking at the right house! In this example, the red "A" balloon/pin was pointing to a house next door. So I moved down the street looking for house numbers and names. Great grandpa's home was called Pentreith (as per his obituary and other records) and lo and behold on the house beside the Red "A" balloon was a black door with the number 40 and over it the word Pentreith. That was the correct house. I will be having quite a bit of fun over the next few weeks looking for houses and cottages in England where my ancestors lived. You can do the same thing world-wide but be aware that not all locations have a street view option. But give it a try, see what you can find! Pat Oxley, President of The Federation of Genealogical Societies, reports that FGS has extended the early registration discount for the 2010 FGS Genealogy Conference until Monday, June 21, 2010 at midnight, Central Daylight Time (CDT). Pat says, “we are happy to be able to make this offer and look forward to seeing everyone in Knoxville!” For registration details visit www.fgs.org. Anyone with an interest in genealogy and history may attend this conference August 18-21 in Knoxville, Tennessee. While the Hilton Hotel in downtown Knoxville is already full, she reports there is room at the Holiday Inn. Details are on the FGS website. Coupled with that is another breaking item that “FGS is pleased to announce that the Archivist of the United States, David Ferriero, will be speaking at our FGS Focus on Societies Luncheon on Wednesday, August 18th. If you have already registered you can still purchase a ticket -- this luncheon is open to everyone! Mr. Ferriero will be speaking on the Citizen-Archivist and about the War of 1812 Digitization Project and will also have a question and answer period. We wish to thank Mr. Ransom Love, and the FamilySearch team for graciously welcoming the Archivist to speak in their place at this luncheon. To register for the conference and to add this luncheon visit www.fgs.org and click on the conference logo.” His bio can be found at www.fgsconferenceblog.org. The four day genealogical extravaganza takes place from August 18-21, 2010 at the Knoxville Convention Center. The full program is at the same website and it is chock full of lectures on techniques, records, libraries, archives and many other topics. Some of the top notch speakers from around the U.S. will be presenting these lectures. The local hosts of this event are the East Tennessee Historical Society and the Kentucky Historical Society and these states provide some of the best of the area speakers. Did you watch “Who Do You Think You Are?” on NBC TV this year? 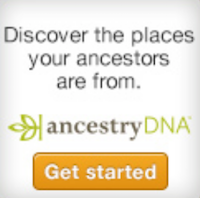 The main sponsor of that show and a generous sponsor of the conference, Ancestry.com , has many things planned for you during this conference. Others who worked on the show and the research will be with us as will D. Joshua Taylor, MLS, who worked with Sarah Jessica Parker on the first episode. Josh will be presenting several lectures during the week and you just might catch him at the Exhibit Hall booth of the New England Historic Genealogical Society where is is Director of Education and Programs. This week the complete U.S. 1910 Federal Census name indexes for Arkansas, Connecticut, District of Columbia, Indiana, Nevada, New Jersey, and Texas were published online at FamilySearch’s Record Search pilot (http://FamilySearch.org, click Search Records, and then click Record Search pilot) or http://Beta.FamilySearch.org. New international collections were published for Brazil, Canada, Czech Republic, Guatemala, Mexico, and Spain! None of this would be possible without the great contributions of many FamilySearch volunteers. These individuals donate the time and effort needed to make these collections freely available to FamilySearch patrons. If you would like to help by donating a few minutes here and there online with projects of personal interest, become a FamilySearch community volunteer at FamilySearchIndexing.org. Many hands produce great work. Thank you for your support! Being an Adventurer Isn't Always Genetic! My mother was born in 1916. It wasn't really a time for women to be independent but my mother was. In the 1950's she was one of the few, if not the only, wife and mother in our little town who worked at a job outside the home. I remember asking her once why she didn't get together with the other moms in town to have coffee like my friends' mothers did. She just laughed and said she'd rather be working. In 1971 at the age of 55, she retired, sold her belongings and bought a Winnebago. With her widowed mother (my grandma) and sister, she began travelling. They started their adventures by driving to Florida and then across to California. They towed a little car behind the Winnebago - mom did all the driving while her sister did the cooking. Grandma used to say that her job was to oversee them both. They called themselves the Merry Widows and were written about in two travelling magazines! 1985: Bought two trailer homes and parked one in Ontario, the other in Florida. Continued to drive around N. America but instead of a motor home, it was in a truck. 1996: On her 80th birthday, no longer driving around N. America, she treated herself to a trip to Australia and New Zealand. She backpacked for 3 weeks, with a little pink Barbie backpack. She made many other trips during this time - to England mostly but also to New York and other places in N. America. 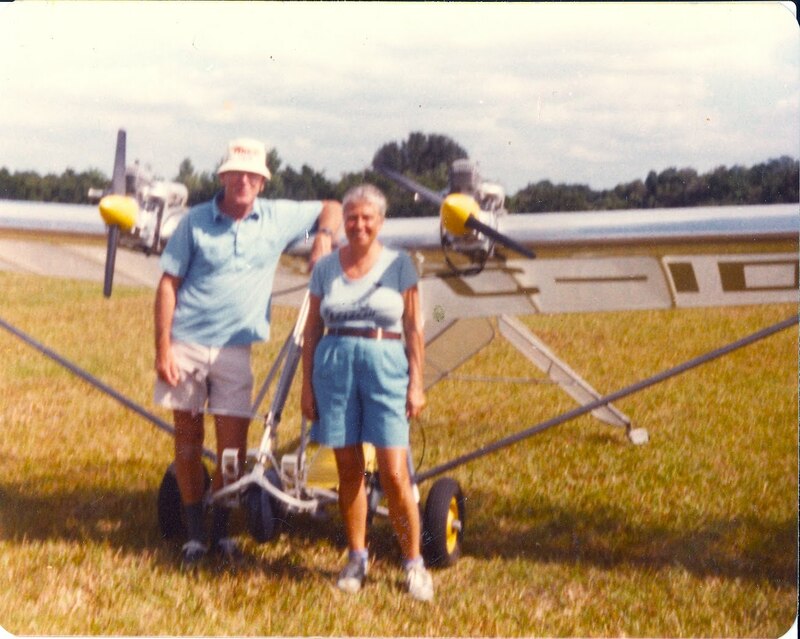 Oh and did I mention that at age 60, she took flying lessons to obtain her pilot's license in America? 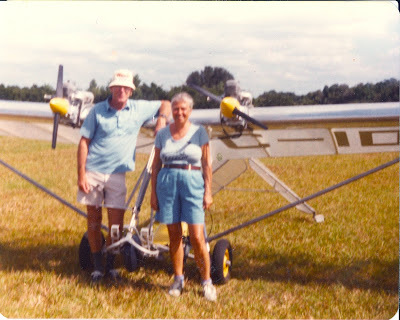 And that she then built her own ulra-light airplane with her boyfriend? 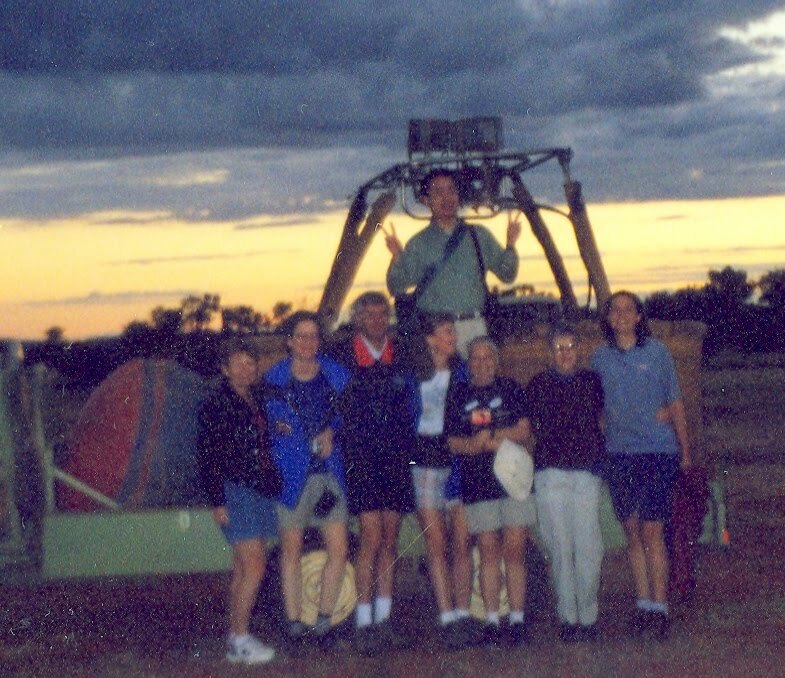 Here she is ready for a hot-air balloon ride in Australia at age 84. She's the tiny one in front holding a cream coloured hat. 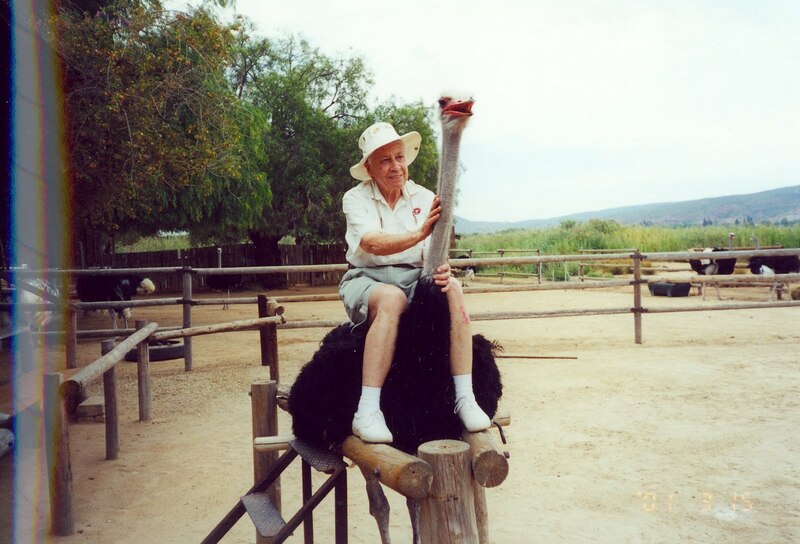 and in S. Africa sitting on an ostrich at age 85. I wish I had 1/4 of my mother's spirit of adventure! But sadly, I don't. So I guess that adventurous spirit doesn't always get passed on through our genetic code or DNA. Randall Packard's lost WW2 dog tags arrived safe and sound at Randall's daughter's home in Nebraska on June 3. It was a special day because June 3 was Randall's birthday and he would have been 93 that day. Congratulations to all my readers who helped make this happen and to Jill for allowing us all to have a small part in getting Randall's dog tags back to family. We have one happy family, I wonder if we can find another? Stanley Thompson's dog tags from WW2 have still not made it home. The 1901 Census of Ireland is now online at the National Archives of Ireland website. All thirty-two counties for 1901 and 1911, searchable by all information categories, are now available. This is great news for those with Irish ancestors in the early 1900 time period. The Southern Israelite Archive now includes issues from 1959-1983, and spans the years 1929-1986, including over 48,000 images. Rabbi H. Cerf Straus established the Southern Israelite as a temple bulletin in Augusta in 1925. The publication was so popular, he expanded it into a monthly newspaper. Later in the decade, Straus sold the paper to Herman Dessauer and Sara B. Simmons, who moved the paper to Atlanta, where it began circulating state-wide and eventually throughout the South. In 1930, M. Stephen Schiffer, a former employee of the Atlanta Georgian, took over as sole owner of the Southern Israelite. Even in these earliest years, the paper not only covered the news of the southern Jewry, but also the issues that involved Jewish populations throughout the nation and world, including the Holocaust and later the creation of the Jewish state of Israel. In October of 1934, the Southern Israelite began publishing a four page weekly edition, supplemented by its established monthly magazine edition. Ownership of the paper was turned over to a corporation headed by Israelite editor Adolph Rosenberg in 1951, while the paper continued its mission as the voice of the Jewish community in Atlanta. In October of 1958, the paper was at the forefront of the coverage of the Temple bombing in Atlanta, giving its readers a unique first hand perspective. The monthly edition of the paper was discontinued in 1973 in favor of its increasingly growing weekly edition. In 1987, the paper changed its name from the Southern Israelite to the Atlanta Jewish Times and guaranteed at least thirty-two page issues moving forward. The paper is today owned by Jewish Renaissance Media and continues as a weekly publication with a readership of over 25,000. The Southern Israelite database is a project of the Digital Library of Georgia, a GALILEO initiative that shares Georgia's history and culture online. Digitization is made possible by the Cuba Archives of the Breman Museum and the generosity of the Srochi family of Atlanta. 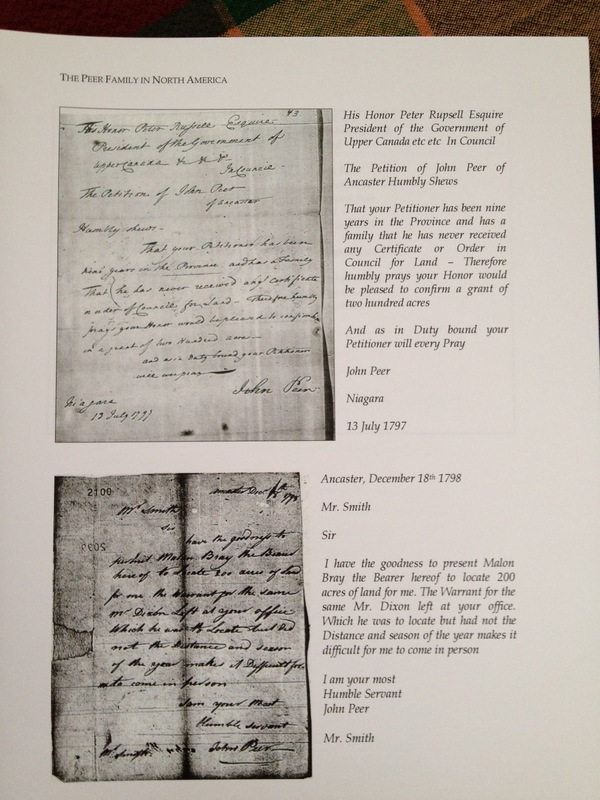 Can You Teach an Old Genealogist New Tricks? Oh boy. I never learn. Or I learn the hard way. 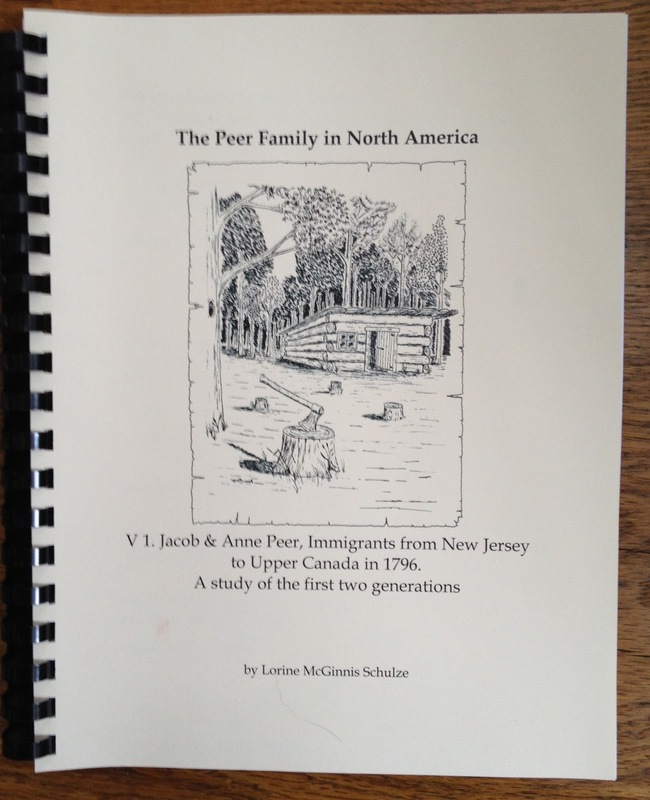 Over the last 30 plus years I've been diligently researching the Peer family of America. They came to Ontario from New Jersey in the 1790s, some stayed and some returned to America. There are descendants all over N. America. My goal has been to publish a book (or books!) on the family. With that in mind I've "met" many descendants online. They've generously shared their family information and photographs. Over the past month I've gotten closer to my goal of publishing my book. I've had to break it into several books as it was well over 1,000 pages in the draft format. It works well to have Vol. 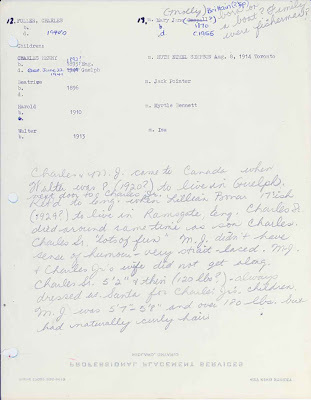 1 on the immigrant ancestors Jacob & Ann - details, documents, maps, a genealogy summary of their children and children's spouses. Then each child of Jacob & Ann gets their own volume which digs down into 4 or 5 generations. Each subsequent volume for each child (there were 8 children so 9 volumes total) will contain narrative chapters, a genealogy report and notes, maps and so on. I have wonderful photographs sent to me by other branches and other researchers and these are to be included. Sounds easy but it requires careful organization to compile all the data, documents and photos. The problem? Remember I said "30 plus years..."? The photos that didn't come via email are scanned and in folders on my computer. The emailed photos are in folders on my computer. But over the last 10 years I've upgraded computers several times and so there are several folders scattered on my hard drive. I spent the weekend moving photos into the correct folders, one per family branch (or volume). I was pleased to find that I had enough foresight to give each photo a good long file name such as "WilliamAlexAlviraJoseph.jpg" That allowed me to look in my genealogy program and find the branch that the photo fits into. On some photos I even added the contributor name such as "WilliamAlexAlviraJosephFromThomas.jpg" Great! I know who shared the photo and can add their name in the books appropriately as the contributor. But some photos have no contributor name. In my genealogy program under the name of the Peer individual it says simply "See email for more information on photo" Oh no! I didn't say who sent the photo! I just said to check my email. But a search of all my email addresses (current ones) didn't turn up every contributor. I realized that I had a very old computer which was networked to my main one and when I got rid of the computer I neglected to copy my email files to the new one. Therefore I do not know the names of every contributor who sent photos. I know most, but not all. I'm horrified at my carelessness. Many of the photos were sent to me several years ago and I simply don't recall who might have sent them. 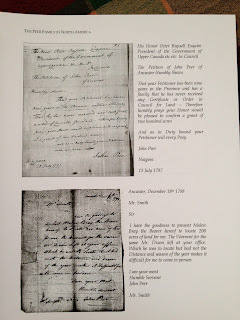 With any luck, Peer descendants with whom I've been in touch over the years will read this post and contact me to tell me they sent me photos. Most of the 60 or so photos have contributors' names attached but about a dozen have no contributor name(s). I know better now. I'm an old genealogist but I am always learning. The hard way. My new trick is to notate items properly and carefully at the time I find or receive them. No more setting them aside for later.